May 1st was full of surprises. Everybody’s reports are coming slowly, but you can read them on the usual brussels-farmer.blogspot.com (in french mostly, sorry). You are invited to submit yours. 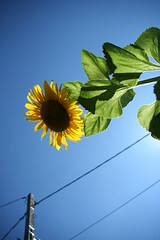 We like to plant with you as much as we like to read your sunflower stories. But, quickly to the purpose of this mail: the next Brussels’ sunflower guerrilla plantation day. The meeting is set at “jardin du Botanique”, in the park in front of the rotunda, at 13h, this Thursday 17th of May. We will spread and go planting from 13h30… until…. we meet back at “place de la liberté” (Liberty place) for the usual drink. If you have never joined us the past times, we strongly encourage you to come to this unique moment of peace with our city environment. Please bring a sharp tool to make holes for the seeds and a camera for the memories ;-). We bring the rest.